a. Cleaning oil spilled on metallic chequered plates, epoxy floors and shop floors: Due to frequent oil spills on shop floor and mud deposits over it, a solid oil-mud cake gets formed. Our oil cleaning solution is able to dissipate this solid cake formation and dissolve the oil such that it can be washed off from the shop floor using water. If this exercise is repeated 2-3 times, you can expect an oil-free and dirt free, clean shop floor. Subsequent regular floor cleaning using small quantity of our oil cleaning solution will ensure that the shop floor is maintained oil-free, clean and neat. b. Cleaning oil from plastic trays, crates and bins used for carrying oily metal products: Metallic bur and oil get deposited in plastic trays. These are difficult to remove. Many times, high-pressure washing-machines are used to clean such trays. The oil and metallic bur falls into these washing machines, causing choking of filters and stoppage. If plastic trays are dipped only for few minutes into our water-diluted oil-cleaning solution, the oil is cleaned and metallic bur falls off easily. Use of expensive tray washing machines could be avoided in many cases. In most cases, subsequent washing operations are much more effective. Problems of filter choking and excessive load on motor due to metallic dirt is avoided. c. Cleaning of workmen's hands: Use of sawdust and washing powder detergent for cleaning oily hands is not effective, neither environment friendly. It also leads to dryness and scaling of hands. As opposed to this, use of our oil cleaning solution effectively dissolves the oil and does not cause harm to hands. d. Cleaning of oil from machinery without damaging its glossy paint finish. f. Degreasing of oil-quenched forgings and cleaning of quenching oil from floors. O-CLEAN3 oil-cleaning liquid is a water-based, environment friendly cleaning solution. It can be used for completely dissolving and cleaning oil from shop floors, machinery and workmens' oily hands. O-CLEAN3 has proven to be much more effective, economical and human-friendly as compared with cheap detergent, kerosene or acids. For first use, to remove solid layer of oil and dust from shop floor/ machinery accumulated over many years, the product may be used directly. 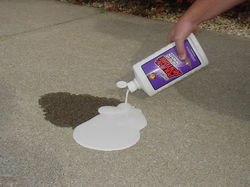 For subsequent regular use to maintain oil-free floor and machinery, the product may be diluted in water from 1:5 to 1:15 ratio, as found suitable. 1. Removes solid layer of oil and dust settled on floor for many months. Manpower and time for cleaning is substantially reduced. 2. Removes oil and dirt from machinery, without affecting paint finish. 3. 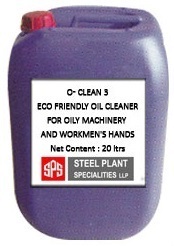 Completely cleans off oil from workmen's oily hands without causing dryness, burning or peeling of hands. Shelf life: 12 months in factory sealed condition. Looking for Oil Cleaning Chemicals- Water Based, Environment Friendly ?